> McAfee > See how organizations are using Virtual Patching to meet compliance requirements with no downtime. The frequency and sophistication of attacks shows no signs of declining, and today’s economic climate does not allow for more resources to be applied to the challenging task of testing and applying physical patches promptly upon their release. 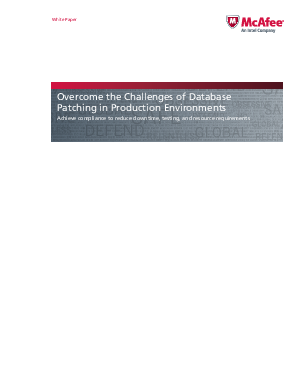 Combined with the compliance framework of SOX, HIPAA, PCI DSS, and the like, the need to demonstrate adherence to a strict patching policy will only become more demanding, and the use of McAfee Virtual Patching for Databases makes perfect sense for closing the window of risk, while saving dollars and minimizing business disruption.